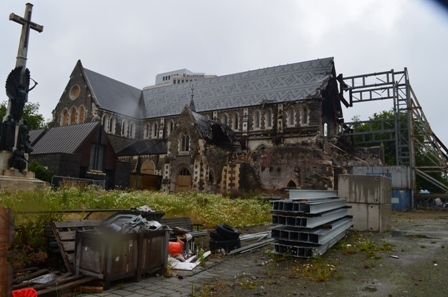 I was well aware of the devastation wrought upon Christchurch from the 2010 and 2011 earthquakes. It was talked about extensively in my guide book, and my mother visited there nine months prior and she showed me some of the pictures. So I can’t say I was shocked at what I saw, but it was still strange to see that level of damage to a developed, Western city that is not an active combat zone. 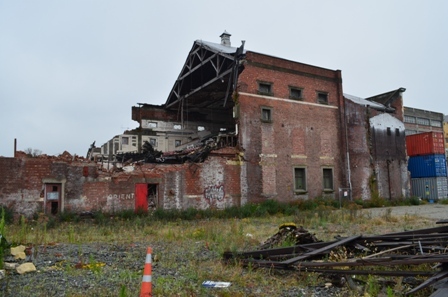 So many buildings have been demolished already, leaving a barren empty lot in its place. But many more buildings still stand condemned and abandoned. Many of the businesses have relocated either to the suburbs or to transition locations. 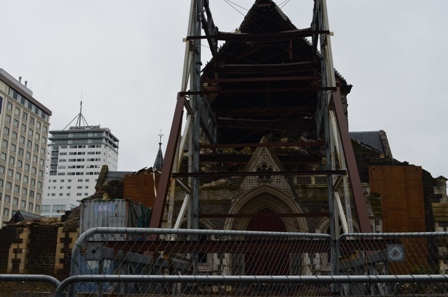 However, that doesn’t mean that Christchurch is down and out. Most of the damage was confined to the city center, but plenty other parts of the city are perfectly fine. 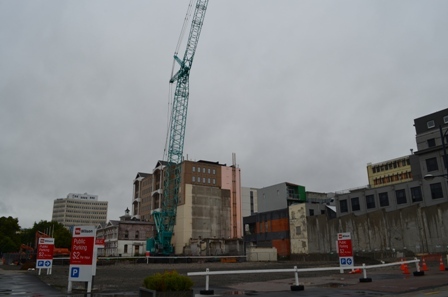 And even in the damaged center, Christchurch is making a recovery and has established transition projects. 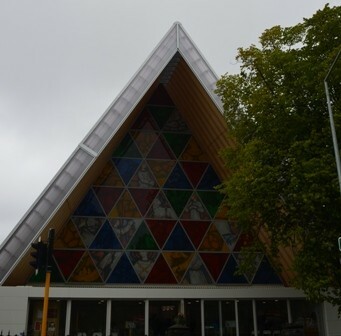 A good example is the Christchurch Cardboard Cathedral. 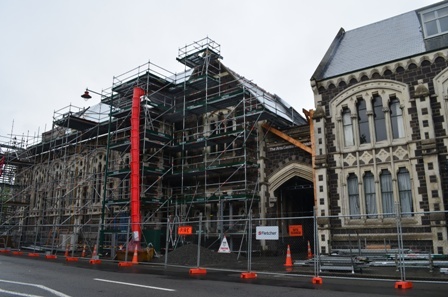 In the earthquake, the Christchurch Cathedral was irreparably damaged, and even though it still stands, it is blocked off and it is estimated that it will take 10-15 years to repair. 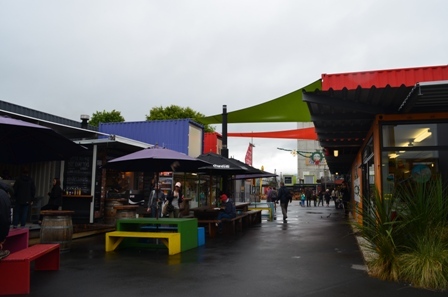 But Cathedral Square was reopened in June 2013, so it is possible to get closer to the Cathedral. 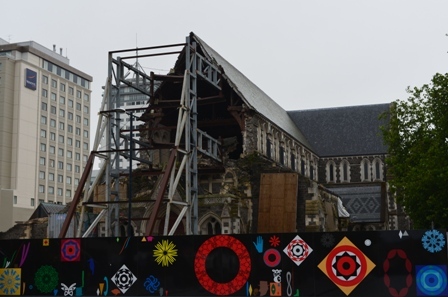 In its place, the Cardboard Cathedral was constructed as a transitional place of worship for Christchurch residents. It was constructed internally with 98 huge cardboard tubes, and even though it is still considered transitional in concept, it is estimated that it could last for 50 years. 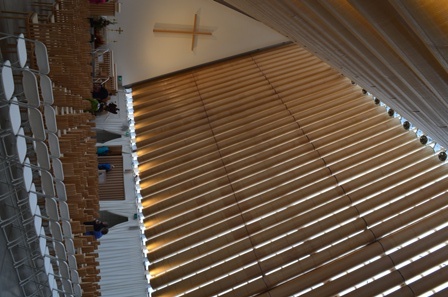 The Cardboard Cathedral’s references some of the Christchurch Cathedral in design structure, but it has its own style as well. 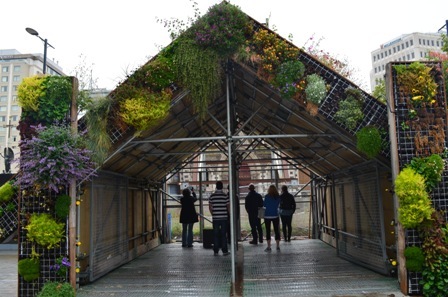 Since it is considered a temporary structure (in theory anyway), the interior is pretty spare, but that actually sort of enhances the atmosphere. Another transitional structure that is reinvigorating the city center is the Re: Start mall. 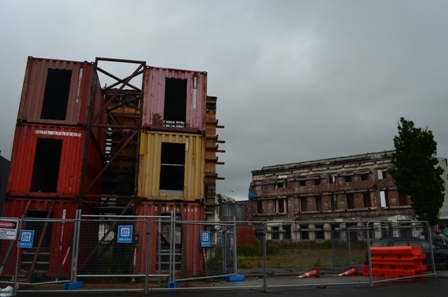 It is set up a few blocks from the worst of the earthquake damage, and many of the businesses (around 51 retailers in total, including Ballantynes- Christchurch’s beloved department store) destroyed from the earthquake relocated there. 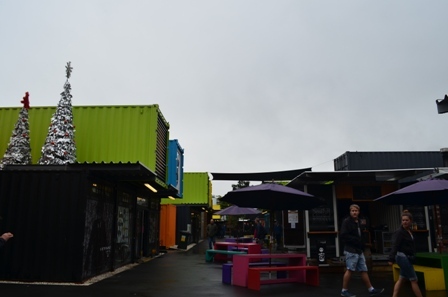 The stores are set up in brightly painted shipping containers and give off a festive, urban, open-air shopping environment. 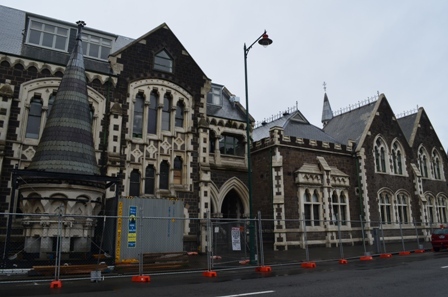 Unfortunately the beautiful, Victorian Gothic Arts Centre was pretty severely damaged, so I couldn’t visit it, but I could see what it probably looked like at its peak. 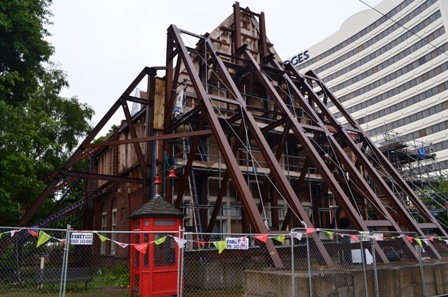 Christchurch is definitely a city in transition at the moment, but even among the damage, the city is slowly rebuilding itself to its former grandeur. 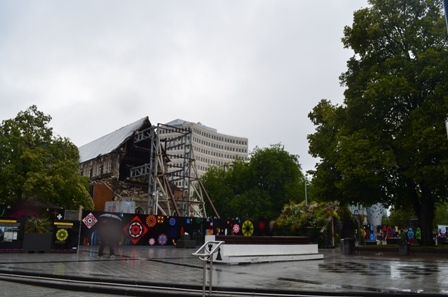 This entry was posted in Travel and tagged Arts Centre, Cathedral Square, Christchurch, Christchurch Cardboard Cathedral, Christchurch Cathedral, earthquake damage, Re: Start mall.